Saskatchewan wants to increase its understanding of the distribution of clubroot in the province. The Ministry of Agriculture will conduct an extensive clubroot survey in the highest risk regions of Saskatchewan, which will include (1) areas in close proximity to clubroot infested areas along the Alberta-Saskatchewan and Saskatchewan-Manitoba borders; (2) high canola production areas; and (3) regions with favourable environmental conditions. This survey will start in mid-August. One field will be randomly surveyed in each of the 1,800 townships throughout the survey area. In each field, plants will be uprooted to examine for clubroot galls on the roots. Soil samples will also be collected at the field entrance for DNA testing to detect if the clubroot pathogen is present in the soil. When positive fields are found, the landowner and/or producer will be contacted and informed of the positive clubroot finding. Since clubroot is a regulated pest in Saskatchewan, the legal land location of all positive fields will be reported to the appropriate rural municipality (RM). Under The Pest Control Act, RMs have the authority to undertake prevention and enforcement measures related to the spread and control of clubroot. The Ministry is encouraging RMs to regulate in a fair and consistent manner, following a farmer-driven approach. This ensures landowners or producers have a say in how clubroot is managed on their farm. By working with a professional agrologist, this farmer-driven approach will achieve an effective, science-based clubroot management plan for their farm. The general location of all clubroot infested fields will be shared publicly through a clubroot distribution map. 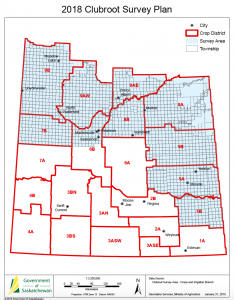 This map will indicate the distribution and severity of clubroot within the surveyed area and will be used to raise awareness and encourage informed and proactive clubroot management. It aims to optimize consistency and meaningfulness with maps from Manitoba and Alberta.